This is a great match. When two Sagittarians meet, something just “clicks”. Sagittarius, the 9th sign of the zodiac, is represented by a Centaur, an intellectual creature of Roman mythology. Sagittarians, like the Centaur, are intellectuals with a thirst for knowledge. They are clear thinkers who have a big picture perspective and try to always look for the best in every situation. Sagittarians also enjoy exploring the world, seeking out new, fun experiences and travel. So when two Sagittarians fall for each other, they both match each other’s intensity and create a really energetic and fun relationship. They have similar needs in a relationship as both partners crave a partner with whom to laugh, live and learn. Each half of this couple satisfies this need in the other. Sagittarians are not deep, overly emotional people; they favor a positive outlook, optimism, humor and faith over depth of emotion. What this relationship may lack in emotional depth, they more than makeup for with good conversation, humor and shared fun experiences. Sagittarius is a fire sign and just like fire, they can move quickly and uncontrollably from one thing to the other. Sagittarius is all about action and adventure. It is therefore no surprise that in Sagittarius-Sagittarius relationships, a dull moment simply does not exist! Since both partners are born under the same sign, they better understand and can relate to each other. This can make a great match and a fulfilling long-term relationship. The Sagittarius Male: The Sagittarius man is a clear, logical thinker, with a big picture approach to any situation. He is a born leader, generous and just and an eternal optimist. However, he is difficult to pin down as he is an adventurer at heart, can be easily distracted as he loves the thrill of the chase. The Sagittarius Female: The Sagittarius woman is a confident optimist. She is an adventurer who seeks out adventure whether at work or play. She also has an unquenchable thirst for knowledge and an eternal curiosity that will never be completely satisfied. She often fears intimacy, and for her, love often blossoms naturally from friendships. 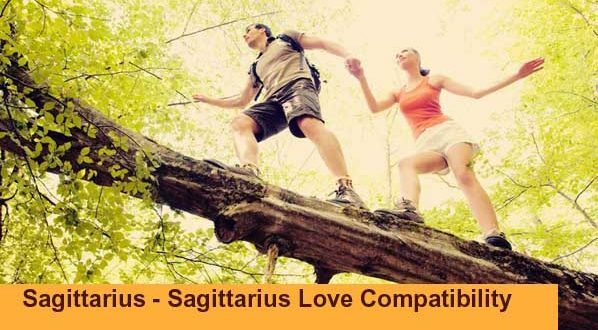 The Sagittarius-Sagittarius relationship is a great match; nonetheless, it still has its imperfections. Sagittarians “shoot for the moon” in all things and this lends itself to impractical thinking. In a Sagittarius-Sagittarius relationship, neither partner is practical (especially financially and money problems will definitely arise sooner or later). As Sagittarians, both partners love their freedom a bit too much and are also unemotional. This creates a greater chance of the relationship ending over some minor problem. Astrologer Navneet Khanna, is a former World Bank & SIDA consultant, he has held many prestigious projects in India and Africa before settling down in his native place, near Chandigarh and following his passion in Vedic Astrology. Navneet is very scientific and logical in his Predictions. He reasons his predictions because of which he has a worldwide following and people from many countries solve their problems with his help. He is an expert in Marriage and Love Relationship. In Marriage Matching he does analysis of Guna Milan and also Grah Milan (Matching of the Planets) and will tell you effects and remedies of Nadi Dosha, Bhakoot Dosha & Gana Dosha if present. He is an Expert Astrologer on Many Indian & Foreign Websites like myastrologysigns.com and a frequent writer for many national and international websites and magazines. Navneet believes that Vedic Astrology is a vast subject, it is an ocean of knowledge and wisdom. It is simply up to the individual to jump into the ocean and extract the pearls. With his vast experience on occult subjects he has been associated with leading astrologers in India to promote astrology. Navneet Khanna believes that the energy and inspiration behind him is the Blessings of the Almighty. You may contact him on his number 0091-9417884861 . Is divorce/ second marriage indicated? Will i get married this year?